H2 Hostel Hebron v Hebron, Palestina: Zarezervujte nyní! 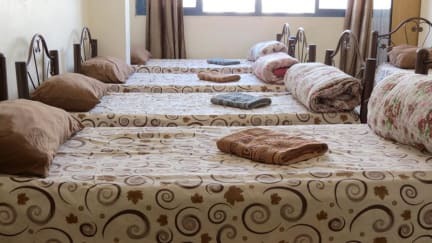 H2 Hostel Hebron is ideally located in the Heart of Hebron, right next to the Old City, the fruit and vegetable market, supermarkets, banks, restaurants, shisha bars, and less than a 5 minutes walk away from the bus station. We have a bedouin style living room, a smoking room (with shisha), a shared kitchen, and soon you will also have access to our great rooftop where you can enjoy the view over the Old City. We provide lockers, free WiFi, maps, plug-ins and fans in each room, towels, hairdryer, as well as a laundry service (20NIS) and breakfast service (for an extra 10NIS). We also offer tours which will help you to get a better insight into the social and political situation of this unique city and country, as well as a great introduction to the Palestinian culture. Our friendly staff are always available to help you to find your way around, organize your trip, give you information and recommendations, and share a good time!